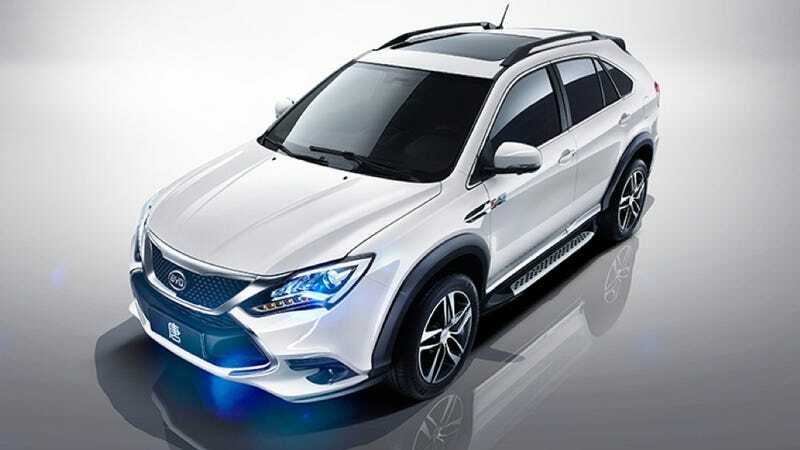 The BYD Tang 542 has just arrived as the most powerful plug-in hybrid SUV in the world. 505 horsepower, 530 ft-lbs of torque, starting price of about $48,000. Sounds like it's going to move quick, even though "542" has nothing to do with displacement. Tang is powered by a two-liter turbo 205 horsepower gas engine and two electric motors making about 150 horsepower apiece, one of which is over the rear axle. Range in full-electric mode is only about 50 miles, but it can charge off a 200 volt outlet which is standard in most of the world. According to Car News China, "542 Technology" and the badge on the door refers to "acceleration under five seconds, four wheel drive, and fuel consumption of two liters per hundred kilometers." Well hell, I'm gonna go hit AutoZone for some stick-on digits if you're allowed to get that creative with numerical badging! As for the "Tang" name, it references a seventh-century dynasty that ruled China for almost three centuries. Can anyone tell us what BYD stands for without Googling it? I'll give you a hint, it's kind of hilarious. BYD is reportedly the first automaker to offer interior air purifiers; which seem more "necessity" than "luxury" in a place where you can't cut through the smog with a Death Star laser. Purifiers in the Tang "can bring the PM2.5 index down from 700 to 12 in only four minutes." Our friend Tycho at Car News China says "the worst we had in Beijing this year was 543, so that will be clean in about three and a half minutes." The BYD Tang will be released with a few limited edition variants, one of which is dialed up to do 0 to 60 in 4.4 seconds, rocks this bodykit with a wild underbite and will sell for almost $100,000. I'm gonna go ahead and guess the value's easier to realize in the base models here. BYD is based in Shenzhen and partially owned by Warren Buffett's evil empire Berkshire Hathaway Inc. They're planning on building a lot more SUVs while moving their focus to plug-in hybrid propulsion. "SUV sales have been rising at a fast pace and we have enough capacity to make SUVs," BYD Chairman Wang Chuanfu told Bloomberg. "We will stick to the direction of plug-in hybrids." Makes sense in a country where government incentives can cut the price-to-consumer of hybrid vehicles like whoa. Tycho tells us a $48,000 Tang would be as cheap as $35,000out the dealer door if a customer cashed in on the maximum allowable incentives. The company's already planning three more plug-in SUVs for the near future, named Song, Yuan, and Ming. The Tang's look is decidedly Lexus RXy and Kia Sorentoish, but this is one of the first Chinese-made passenger cars I've seen some real originality in to get excited about. Images via BYD and CarNewsChina, hat tip to Tycho and Jeff Green!